A coal mine in northern Queensland was faced with a fire system that was blocked with a limescale build-up. Triple7 Enviroscale Plus easily broke down the scale, outperforming the previously used hydrochloric acid based product. Using the biobased product also removed the risk of corrosion or damage to elastomeric surfaces during the flush. The low risk acid blend especially designed with human safety in mind meant that minimal safety equipment was required. Triple7 Enviroscale Plus is safer to use, store and handle than conventional acids. The coal mine now has a fire system that works at full capacity with no corrosion issues. They have achieved this outcome with cost savings! Using Triple7 Enviroscale Plus at a 25% dilution results in reduced product consumption (previous product used neat), less inventory, lower transportation costs and improved environmental discharge. Providing safer products that saved time, effort and money while improving environmental outcomes. Triple7 Enviroscale Plus enabled the mine to remove scale without dismantling or servicing of equipment due to it protecting surfaces it comes in contact with. A coal mine near Mackay, Queensland was experiencing scale build-up in their water supply and fire system ring mains, with a threat of blockages causing a potential disaster scenario. This was due to the poor water supply in the isolated environment causing significant scale issues. How do you successfully descale water supply systems without hazardous chemicals? 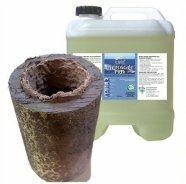 Traditionally a pipe descaling process would be undertaken with a Hydrochloric based limescale remover that is both corrosive to equipment surfaces and exposes workers to possible health risks. Hydrochloric Acid is registered as a Class 8 Dangerous Good with highly corrosive properties, which can cause significant asset damage from metal corrosion. Hydrochloric Acid also creates health and safety problems, increasing the regulatory burden on organisations due to its transport, storage and handling restrictions. According to regulations all products containing hydrochloric acid must be labelled with; POISON! DANGER! CORROSIVE. LIQUID AND MIST CAUSE SEVERE BURNS TO ALL BODY TISSUE. MAY BE FATAL IF SWALLOWED OR INHALED. INHALATION MAY CAUSE LUNG DAMAGE. Envirofluid conducted laboratory testing with a scale sample from the mine. Triple7 Enviroscale Plus easily broke down the scale, outperforming the previously used hydrochloric acid based product. Triple7 Enviroscale Plus is a biobased product so has the added bonus of reduced handling and WHS issues. Using the biobased product also removed the risk of corrosion or damage to elastomeric surfaces during the flush. The use of Triple7 Enviroscale Plus saved the mine a significant amount of money. They were using the previous hydrochloric acid based product at full concentration. However when using Triple7 Enviroscale Plus at a 25% dilution they still experienced superior cleaning results. The coal mine now has a fire system that works at full capacity with no corrosion issues. They have achieved this outcome with cost savings! Using Triple7 Enviroscale Plus at a 25% dilution results in reduced product consumption, less inventory, lower transportation costs and improved environmental discharge.